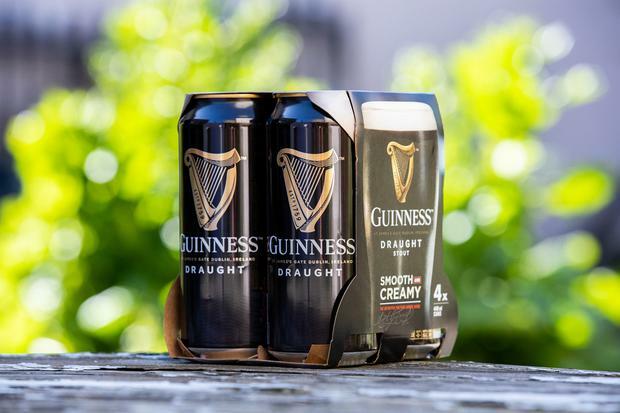 The maker of Guinness has announced it is removing plastic from its beer packaging. Plastic ring carriers and shrink wrap will be removed from multipacks of Diageo's beer products - Guinness, Harp, Rockshore and Smithwick's. They will be replaced with 100pc recyclable and biodegradable cardboard. The multi-can packs will be replaced by cardboard packs. Individual cans are fully recyclable. The new packaging will be on the shelves in Ireland from August, while the UK and other international markets will follow in 2020. To achieve this, Diageo is investing €18.5m to reduce the amount of plastics used in its packaging. Diageo says that currently under 5pc of its total packaging is plastic and this change will reduce plastic usage by over 400 tonnes annually. "For 260 years, Guinness has played a vital role in the communities around us. "We already have one of the most sustainable breweries in the world at St James's Gate and we are now leading the way in sustainable packaging." Environmental Protection Agency Director Dr Eimear Cotter welcomed the move. "EPA welcomes this announcement to reduce plastic packaging," Ms Cotter said. "EPA's waste characterisation study published last year showed that plastic is now the largest waste type collected from households, comprising 17pc of waste. Over the last 10 years packaging waste has increased by 6pc. "The EPA prioritises waste prevention over other waste management options and therefore we welcome industry initiatives that reduce plastic packaging on products." Donna Cooney, a spokesperson for VOICE Ireland, an Irish environmental charity, said: "It’s a very welcomed development and a positive move in the right direction. "The plastic rings around beer cans can be very damaging for wildlife, as we see photos of birds with their necks caught in the rings."